You don’t need special prognostic powers to know that the 2019 elections will be fraught with frightening fraud. Here are three reasons why anyone who spares a thought for the future of democracy in Nigeria should be worried. 1. Nigerians feel oddly smug and empowered by the possession of their Permanent Voters Card (PVC). They think it's their bulwark against Buhari's continuing incompetence. I am sorry to be a party pooper, but the truth is that in Buhari's Nigeria, the PVC is becoming worthless, as we've seen in most of the elections conducted while Buhari is president, the latest being the Osun governorship election. The Independent National Electoral Commission deployed what I call electoral legerdemain to rig the Osun State governorship election for the All Progressives Congress. Even APC chairman Adams Oshiomhole admitted in an instructive slip-up that the Osun election was rigged. "I think that for democracy to flourish, only those who can accept the pain of RIGGING, sorry defeat, should participate," he said during a press conference in the immediate aftermath of the Osun governorship election. That was an archetypal Freudian slip that revealed the unconscious processes in his thought-processes. In other words, what his heart concealed, his mouth revealed. In his classic 1901 book titled The Psychopathology of Everyday Life, Sigmund Freud said we often suppress untoward or socially unacceptable thoughts (such as admitting that one brazenly rigged an election), which then settle in our unconscious realm. However, in our unguarded moments, these suppressed thoughts occasionally bubble to the surface through involuntary verbal miscues. That was precisely what happened to Oshiomhole. 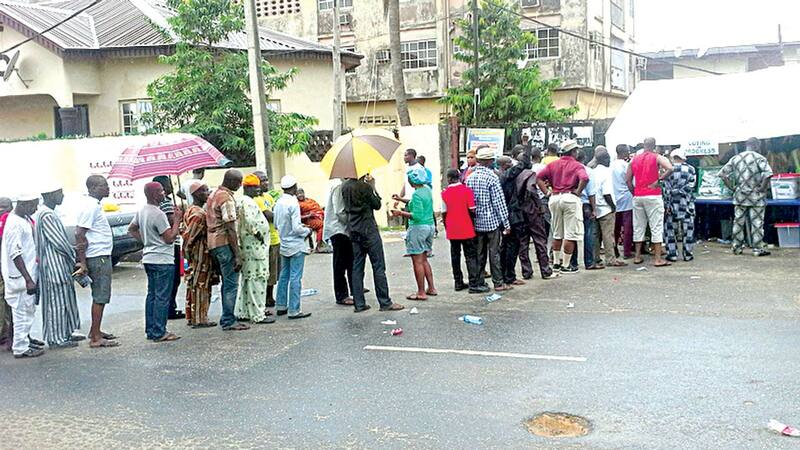 We also saw what happened during the APC governorship primaries in Lagos State. Hired thugs were instructed to forcibly disenfranchise anyone who won’t vote for the candidate that eventually emerged “victorious.” To give just one example, in a viral video, one Oluwabunmi Adetola from Ward E Shomolu in Lagos said thugs beat up people who wanted to vote for Governor Ambode. “The council chairman was going around with thugs, with canes,” she said to wild approval from the crowd. “They were beating people up and down. Even some of our people are still in the hospital. They didn’t allow anybody to vote. They just go [sic] somewhere with all their members and start [sic] voting. Anybody that is Ambode, that they know that you’re doing Ambode, they’d not allow you to vote. So there is nothing like election in Lagos.” A party thug also confessed in a viral video that their “leader” told them to never allow anyone who won’t vote for Sanwo-Olu to vote. (Here is another widely circulated video of voters saying they were disallowed to vote because they supported Ambode). So, obviously, APC has a new rulebook of rigging, and it goes like this: Can't win an election fair and square? No problem. Get INEC to declare the election "inconclusive." During the rescheduled election, hire police officers, soldiers, and thugs to intimidate voters, openly steal PVCs, and then brazenly rig. And, voila, you're a winner! The more electorally vulnerable APC is, the more vicious these agencies will be in their partisanship and strong-arm tactics. If that doesn’t work, hire thugs to screen voters who will allow only those who will vote for you to be at the polling station. Or, as happened in Kano, just manufacture arbitrary but fantastical figures from nowhere and pass them off as the number of votes your preferred candidate won. Because APC has gotten away with these newfangled rigging strategies, they will perfect and replicate them in 2019. Watch out. 2. All indications show that Buhari would lose the 2019 election if it's free and fair because he is almost back to his provincial pre-2015 electoral map. From recent election results in southwest Nigeria, one of the voting blocs that gave him victory in 2015, it’s obvious that Buhari won’t win the region in 2019. Northern Christians who voted for him for the first time in 2015 (he won the predominantly Christian Benue and Plateau states, for example) won’t vote for him in 2019 for obvious reasons. Of course, southeast and southern minority voters whom Buhari injudiciously called people who gave him only “5 percent” of their votes won’t vote for him. In other words, Buhari’s electoral map has shrunk to what it used to be before 2015. Here is why this matters. Buhari never believed he lost the 2003, 2007, and 2011 presidential elections even though he never campaigned outside the north and was voted for mostly by northern Muslims whose votes alone are not sufficient to make him—or anyone—president, as the 2015 presidential election clearly demonstrated. (In spite of his 2015 makeover, which won him new voters in the southwest and in the Christian north, he defeated Goodluck Jonathan by fewer than 3 million votes). A man who believed he was “rigged out” even when he never ran a national campaign and was popular only within his primordial constituency won’t give up power when he loses an election as an incumbent. But it isn't just that Buhari might not hand over power even if he is defeated; he might seek to be president for life if he manages to survive a second term. It is apparent that Buhari just loves power not because of what he can do with it to improve the lot of the people who elected him, but for the perks and attention it confers on him. He can't imagine life outside it. 3. The current INEC is not the same INEC Professor Attahiru Jega headed. Like all human beings, Jega isn’t perfect, but anyone who knows him will admit that he is a scrupulously fair-minded person whose singular obsession is always to make a mark in anything he does. When I congratulated him in 2010 upon his appointment as INEC chairman, he said, “You should rather commiserate with me.” He said that because he had anxieties about the legacies he would leave at INEC, about public perceptions of his fairness, etc. He requested me—and everyone that was close to him—to help him with suggestions on how to restore integrity in the electoral process. It wasn’t that he didn’t have ideas of his own; he wanted more ideas. He even offered me a job at INEC, which I couldn’t take, and which sort of strained our relationship a little bit. I share all this to let the reader know that Jega was genuinely invested in a free and transparent electoral process because he was conscious of his pedigree and desirous to leave a legacy. I think even his worst critics would concede that he is far and away the best electoral chief Nigeria has ever had. The current INEC chairman, Professor Mahmood Yakubu, is known to me personally, too. He is one of the most brilliant scholars anyone can ever wish to meet. His razor-sharp intellect is outmatched only by his piercing wit. Nevertheless, he is no Jega. He isn’t encumbered by the sort of self-imposed moral burden that drove Jega to reform INEC and to remain above the fray. Yakubu sees himself as an APC appointee who is beholden to the party. I have no confidence in his capacity to be fair in the 2019 presidential election. I hope he proves me wrong. I wish I could be more optimistic, but the danger signs are too glaring to ignore.